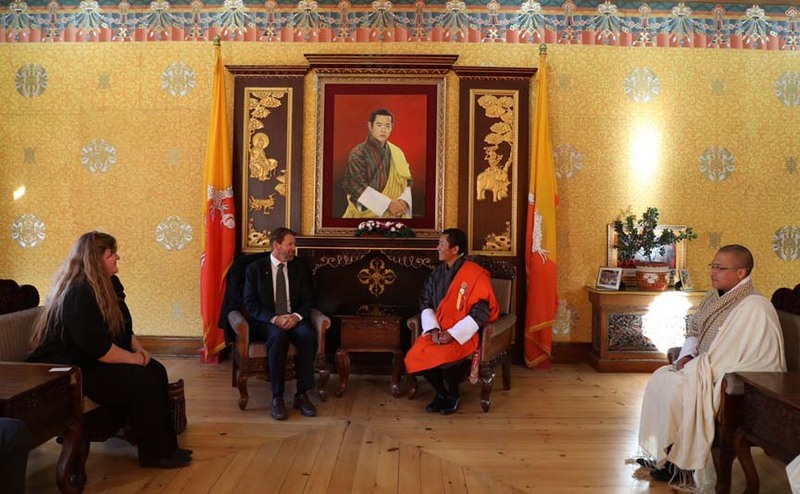 A delegation of the International Committee of the Red Cross (ICRC) led by Jeremy England, the Head of the Regional Delegation, ICRC, called on Bhutan Prime Minister Dr Lotay Tshering in Thimphu on Wednesday. Dr Tshering welcomed the delegation to Bhutan and extended his appreciation for providing training regularly to Bhutan’s peacekeeping officers and officials from RGoB agencies on International Humanitarian Law, said a statement posted on the website of the Office of Prime Minister and Cabinet in Bhutan. England is the Head of the ICRC’s Regional Delegation for Bhutan, India, Nepal and Maldives, based in New Delhi. As per the statement, the Bhutan PM (Lyonchhen) and England agreed to work together in areas of technical expertise on disaster preparedness and youth rehabilitation programmes among others. Bhutan’s association with ICRC dates back to times of World War-I when the First King, Gongsar Ugyen Wangchuck, made a contribution of Nu. 200,000 to the International Red Cross. This evening, Lyonchhen Dr Lotay Tshering met Mr. Jeremy England, Head of Regional Delegation, International Committee of the Red Cross (ICRC) Office and his delegation. The Bhutan Red Cross Society (BRCS), officially launched by the Gyaltsuen (Queen) on May 8, 2017 in Thimphu, is an observer to the International Federation of Red Cross and Red Crescent Societies. The International Committee of the Red Cross works with National Red Cross and Red Crescent Societies, Civil Society Organizations and local authorities to provide humanitarian aid to victims of armed conflict, strife and natural disasters and offers technical expertise in areas of International Humanitarian Law (IHL), emergency response, health and rehabilitative services, humanitarian forensics and detention management, it said. Meanwhile, the delegation along with Dragyel Tenzin Dorjee, Secretary General of Bhutan Red Cross Society called on Foreign Minister of Bhutan Lyonpo (Dr.) Tandi Dorji in Thimphu on Wednesday.